One would guess that I would return here to The Robot after ten days vacation with some long, overly verbose attempt to be profound about my first trip ever overseas (London & Paris) but it’s not happening on this day. Oh, don’t worry though, it will come in the next few days. For now, it’s Item Five time. When I managed to snag an interview with Jay Farrar back in 2004, I was fairly astounded that I’d even managed to land an interview with the guy and even more astounded (and pleased) that the answers I’d gotten back were well thought-out, compelling and dispelled many theories of what Farrar was like. Various comments that came back to me on the interview, sourced from private emails, blog comments and descriptions/links from other blogs, all supported my opinion that it was one of the best interviews published with him at the time. I was so proud to have authored it. Since that time, a few other interviews have surfaced with Farrar that I thought to be equal or superior, particularly a feature in Harp Magazine when the fourth Son Volt album was released last year. When I started doing Item Five, I had made a private vow to not interview anyone twice. As I’ve mentioned here on many occasions, though, this is my blog. It’s the one place on Earth where I unequivically make the rules. Today, I break my private vow and give you another slice of Jay Farrar. 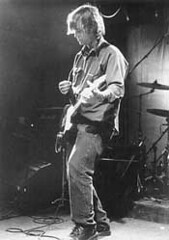 At the time of the last interview, Son Volt had been disbanded for a few years and Farrar had released a couple of solo works, largely acoustic and a tad experimental. Only weeks after I had published my interview here, the Farrar camp announced a new Son Volt lineup and album, flush with more pointed, topical songwriting and arguably even louder than the previous incarnations. The tour in support of “Okemah…and the Melody of Riot” stopped here in Boston in October last year (my comments/review here) and show was an aural assault unlike any Farrar show I’d seen before: powerful and awesome – and that’s saying a lot for a performer who’s previous live shows with Uncle Tupelo and earlier versions of Son Volt were showstoppers. 1. Welcome back to the asylum! Have you missed me? 2. In our last interview in the autumn of 2004, I asked if you might be picking up the electric guitar again soon. Clearly, you did. I think it’s obvious that my line of questioning inspired you to record and release another Son Volt album. Right? Right? I was ready to do another SV recording. You may deserve some of the credit or blame depending on who you talk to. when you hear stuff like that? Initially I usually think about the drug and drink intake of the person shouting out and how much it appears they are having a good time. It’s all part of the roles everyone implicitly agrees to going in to it. Sometimes they build you up, sometimes they tear you down. 4. To that end, can you recall the most ridiculous thing someone has shouted out at one of your shows? Probably the same as everyone else — the guy carrying a six pack of beer in cans shouting “Freebird!” It’s amazing that that uncertain tradition goes back to someone shouting that at the The Band’s Last Waltz concert. 5. “Okemah…” appears to showcase a much more, oh, “muscular” sound for the band. Was it a conscious move to do a more muscular live show, also? I guess looking back the first couple of Son Volt records felt a bit schizophrenic jumping back and forth between electric and acoustic. I’m glad this record wound up mostly electric and uptempo. 6. Is there any way to describe how you feel when you perform a song and the crowd is audibly singing every single word with you? Since reactions can be different from night to night it can be a little surprising when people sing along. Ultimately it’s gratifying but there is always a brief “deer in the headlights” moment of realization because it changes the dynamic(for the better). 7. I’ve been hearing rumblings recently about you and the great Anders Parker recording an album together. Can you please comment definitively on this? You realize that if this happens, my world will be thrown into a beautiful tailspin that I may never recover from. Parker is one of music’s (sadly) unrecognized and absolute geniuses. We did a record comprised of traditional songs that in some cases we reworked lyrics and arrangements. We also did a little bit of free form improvisational instrumental stuff. It’s supposed to come out in the fall. 8. Would you ever try luge or ski-jumping? I don’t think I could. Hockey is enough of a blood sport for me. Those that you mention seem more like death sports. 9. I asked that guy from My Morning Jacket this question and he took me to task: my contention is that Sgt. Peppers is an overrated album. I certainly acknowledge its impact on the process and practices of making “an album,” but I still can easily think of at least 7 Beatles albums I’d rather have and I just don’t think some of those songs are what they’re cracked up to be. Thoughts? Personally I could be happy to never hear “With a Little Help From My Friends” or “When I’m Sixty Four.” If they had included “Strawberry Fields Forever” and “Penny Lane” (maybe they were included in the UK) I think it would have been as great as everyone said it was. I always felt like some of the recordings before and after Sgt. Peppers were more visionary and successfully experimental (Tomorrow Never Knows and I Am the Walrus). 10. Do you get involved in, keep track or even care about how your records sell? Do you read reviews? How involved do you typically get on “the other side” of the business? The dichotomy of art and commerce in music is omnipresent. You have to stay aware to some degree to keep the ship afloat. Definitely gonna pass when he asks. 13. You appear to be the elder statesman in the touring band right now – does that provide for any moments when you shake your head and wonder “was I like that?” Are there “den mother” moments? Everyone had done a lot of touring before making the Okemah record. Being acclimated to the road experience seems more important than age. 14. Thanks. Do this again in another year-and-a-half? See you in a year and a half. love the info.. always looking to feel better and look younger..lol. I def will visit you often! As I get a bit older its important to stay up on the latest fitness and beuty tips..